called the “Jantzen Beach Stable”. the black peekaboo “Portland Horse” greets us. I admit they are a bit dwarfed in stature by the Portland Horse’s amazing mane. What a joy to see coming into work! The Stable holds 8-12 horses. This is where most of the work will be performed. in the room where furniture from the historic Frank Crowe Estate resides. Monterey furniture and they feel simpatico. The long cresting boards are laid out for assessment, above. It’s not all about the horses, though. It is a joy to be around them! 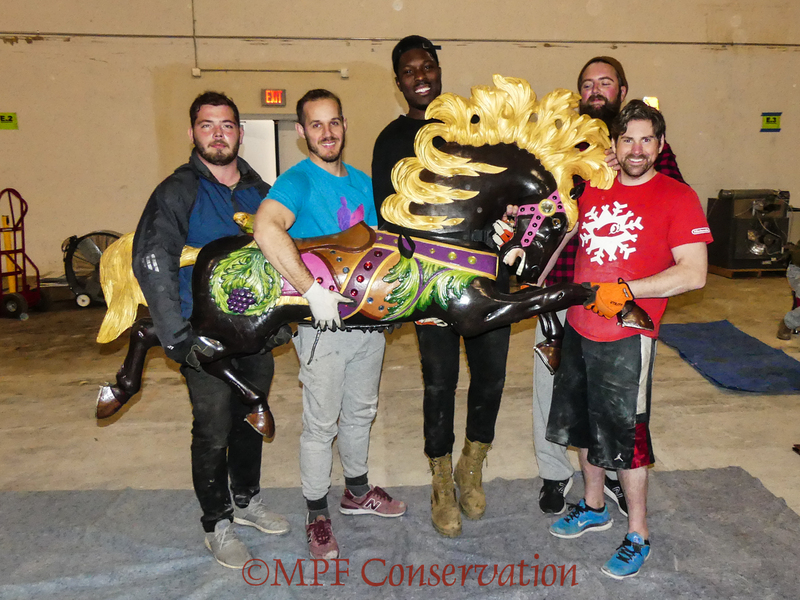 Follow us for updates on the happenings at the stable! We will continue to take you behind the scenes! 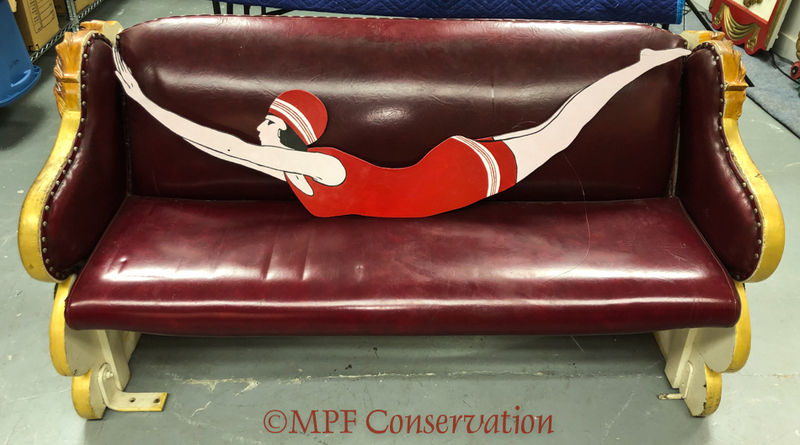 You can also follow us on Instagram (@mpfconservation) or on Facebook ! Written by Kate Powell ©MPF Conservation. May be printed for your own use ONLY, not for use on blogs without permission. 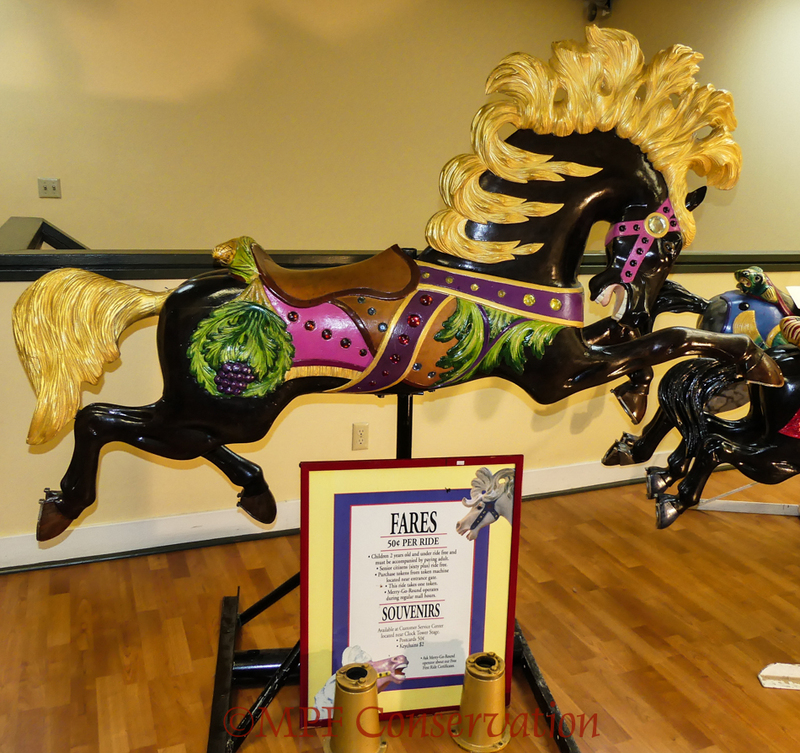 This entry was posted in antiques, decorative motifs, Interim Report, painted objects, preservation, reparation, restoration techniques, wooden objects and tagged #antiquecarousels, #carouselhorses, #cwparkercarousel, #historiccarousels, #jantzenbeachcarousel, #mpfconservation, #nwportland, #objectconservation, #parkercarousel, #polychromeobjects, #portlandoregon, #restoreoregon, #stargazer, C.W.Parker carousel, carousel, horses, Jantzen Beach Carousel, object conservation, painted objects, polychrome, Restore Oregon, wooden object conservation. Bookmark the permalink. 6 Responses to The Jantzen Beach Stable is Full! SSSH! Don’t let them hear you say that!